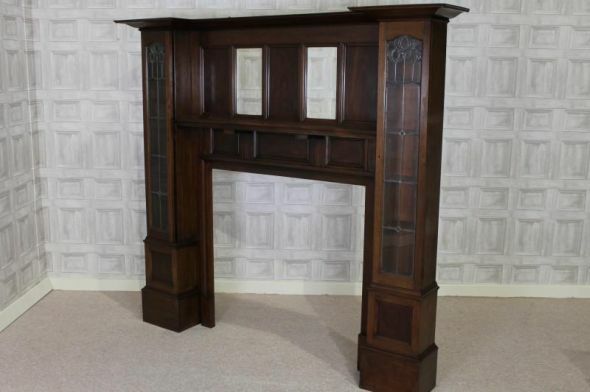 This art nouveau fire surround is a magnificent addition to any period living room or dining room. This beautiful and ornate art nouveau/arts and crafts mahogany fire surround features two small rectangular bevel edged mirrors to entre. This is flanked by two stained glass panel doors which open up to reveal internal shelves. This art nouveau fire surround is in superb condition for its age. Unfortunately the locks in the cupboard doors do not work, but as you can appreciate, a piece of this age will show signs of general wear and tear.